BK Sports/LawFive, Inc. Policies – The information below outlines our online store policies. Orders are processed and shipped from our headquarters in Newbury Park, California. Shipping rates are calculated based on estimated package weight and shipping destination. You will only be charged what UPS charges us once the actual order is placed with UPS. We do not ship to a P.O. Box. 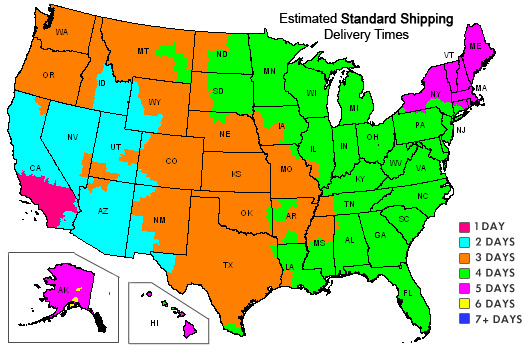 The map below shows estimated Standard Shipping delivery times with UPS from Newbury Park, CA. Hawaii orders are shipped via US Mail. We are currently only shipping to addresses within the U.S. and Canada. We do not ship to P.O. Boxes for your security. All shipments are fully insured in transit and may require a signature upon delivery. Please inspect all packages upon receipt for damage or tampering. All shipment costs will be added when you place your order. If you would like your order shipped faster than ground shipping, please contact us for cost and information. Free in-store pickup is available at the BK Sports retail location in Newbury Park. When using in-store pickup, you will receive an email when your order has arrived and is ready for pickup at the retail store. If an item is backordered, you will be notified via email, it will also be on your order confirmation. You may receive periodic emails updating you on the status of your backordered product. Items purchased from our online site may be returned within 14 days of receipt, as long as the item is in its original, unused condition. Any item that may have been used, altered, or the tags not attached will not be accepted. Items returned and just want the item charged back on the credit card will be charged a 15% restocking fee. You are responsible for return shipping costs. If item is damaged in shipment, please return all packaging with item. We must be notified within three (3) days of receipt of shipment. Contact us regarding the problem and we will give you an authorization number for the return. Receipt must accompany the returned item. Upon inspection of the item, we will refund purchase price only; original shipping charges are not refundable, regardless of reason for return. Product is returned within 14 days of the date it was received. For authorized returns, we credit the order’s original source of payment. The credit amount is equal to the amount paid for the item(s) returned. We do not refund shipping. If you wish to exchange an item for a size, please note the size you wish to exchange for, you will be responsible for the shipping back to you. We do not price-match for purchases. All custom apparel is a final sale. Club members who wish to exchange a non-personalized item (ex. Short, sock) will need to place another order and in the comments state you would like to exchange. All items to qualify for an exchange need to never have been worn and all tags still intact. There will be a restocking fee of 15% added to your exchange. If you have an item that you feel is defective and would like to request a ‘Return Authroization’, please contact us by emailing bksports@lawfive.com with an explanation and pictures of the defect. If your defective return is approved. We will send you a calltag through UPS. A defective product is defined as a damaged product that is unfit for its intended purpose due to manufacturing or design flaw. All of us at bksports.com have been around the soccer just like you and know the normal wear and tear of soccer equipment. Based on our experience, a truly defective product will show signs of being faulty within the first 30 days of use. For that reason we only accept defective returns within that period. Any item that is returned for an exchange is limited to fifteen (15) days from date of shipping. You are responsible for shipping costs of the exchanged and new item. For club member there is a 15% restocking fee. All sale/clearance items are included in our 15 day return policy. As long as the item is in “new, unused and resaleable condition”, it can be returned for a refund within 15 days, minus the 15% restocking fee. All defective clearance or sale items must be processed directly through the manufacturer. All shipping costs are the customer’s responsibility. We guarantee our workmanship. If the item is defective, due to workmanship, we will repair or replace item without additional cost. This policy is effective for thirty (30) days from date of shipment. You are responsible for shipping costs. We accept Visa & Mastercard credit cards, as well as debit cards which bear the Visa or Mastercard logo. American Express or Discover are not accepted. BK Sports/LawFive takes every measure to ensure your safe shopping experience. We process all credit card transactions secure socket layer (SSL) encryption. We also respect your privacy and will never pass your personal information along to third parties. We use the latest encryption technology to keep your information safe. For all orders within the United States, sales tax will be applied to all orders shipped to a California address. If you have any questions or comments about our policies, please don’t hesitate to contact us.